Celebrated in history and song, the Chicago, Rock Island and Pacific Railroad Company—the Rock Island Line—was a powerful Midwestern railroad that once traversed thirteen states with its fast freights and Rocket passenger trains but eventually succumbed to government regulation and a changing economy. Gregory Schneider chronicles the Rock Islands painful decline and along the way reveals some of the key problems within the American railroad industry during the post–World War II era. Schneider takes readers back to a time when railroads still clung to a storied past to offer new insight into the devastating impact of economic policymaking during the 1960s and 1970s. Schneider recounts the largest railroad liquidation in American history—as well as one of the most successful reorganizations in American business—to depict the demise and ultimate collapse of Rock Island as part of a broader account of hard times in the railroad industry beginning in the 1970s. Schneider weaves a complex story of how business, politics, government bureaucracy, and individual greed helped to limit the economic possibilities of the railroad industry and catapult the Rock Island Railroad into oblivion. Weakened by a troubled economy, the Rock fell victim to inept management and labor union intransigence; but Schneider also reveals how government regulations and price controls prevented innovation, hindered capital acquisition, and favored other forms of transportation that lie beyond the scope of regulation. Railroads were even hurt by taxation of property and real estate while competitors were able to use government-subsidized highways and airports without having to pay taxes to fund them. Now that America has gone on to witness the collapse of such mammoth firms as Enron and Lehman Brothers, not to mention the bankruptcy and bailout of General Motors, the story of the Rock provides an instructive lesson in how a major American enterprise was allowed to fall victim to forces often beyond its control—while the bailout of the Penn Central, at the expense of smaller lines like Rock Island, helped initiate the era of too big to fail. 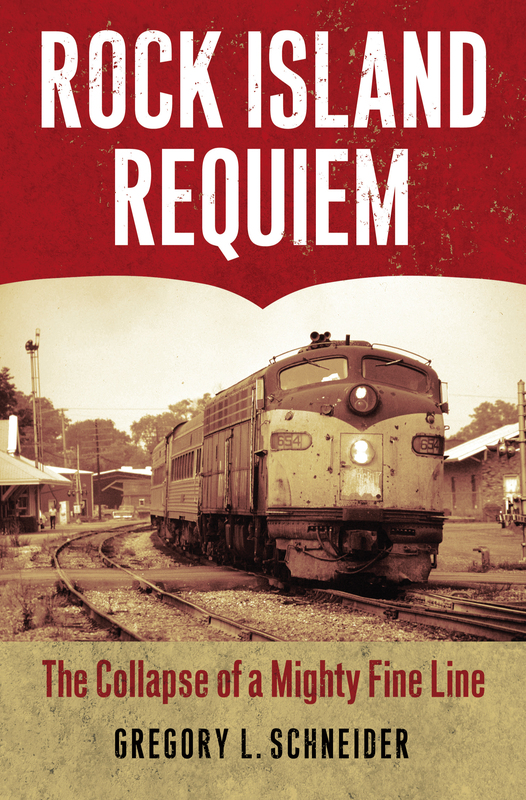 For economic historians and railroad buffs alike, Rock Island Requiem is a well-researched and informative work—and a mighty good read. Gregory L. Schneider is a professor of history at Emporia State University and the author, most recently, of The Conservative Century: From Reaction to Revolution.